When snowboarding first started to catch on among the ski slopes, it was clear that this was a different sport entirely. With it came extreme athletes who wanted to build jumps and soar through the air. To these early snowboarders, the sport was an extension of skateboarding, and so came the creation of snowboard parks filled with table tops, rails and gaps that riders can navigate. In the decades to follow, nearly every ski resort in North America has developed a terrain park. 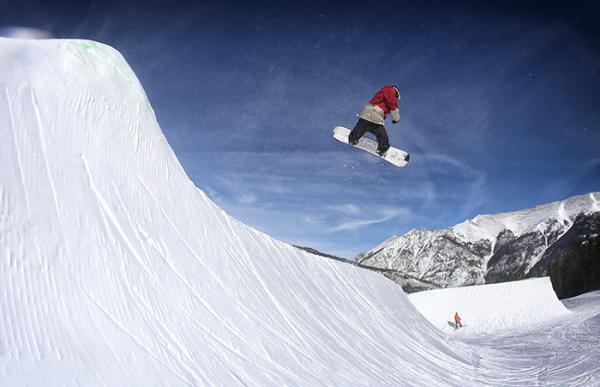 Here are five of the best snowboard parks in America. Copper Mountain in Colorado boasts the first superpipe of the North American season, usually up and running by Thanksgiving. Thanks to a partnership with Camp Woodward, it operates as an almost year-round park. 300 inches of average annual snowfall provides for three lanes of smooth flowing takeoffs and long landings. An array of rail lines and 15 to 35-foot jumps make up much of the park. If your skill set demands more, the biggest jump line offers 65-foot tables. Heading toward the Woodward park area off the Union Creek chair, there is a 13-foot pipe. In West Dover, Vermont the Carinthia Park at Mount Snow offers park enthusiasts 100 acres of 170 park features. The twist here is that it has a theme in line with the region, and that’s farming. The Farm is loaded with barns, shacks, horse trailers and sap buckets. All eight of Carinthia’s parks funnel into the base zone for easy access all around, all day. Mount Snow was also voted the #6 best American snowboarding park in Transworld Snowboarding’s Park Poll 2016. At 60 acres, Keystone Resort in Colorado doesn’t land on the list because of its size. Possibly more impressively, Keystone is among the top snowboarding parks because of its innovation. 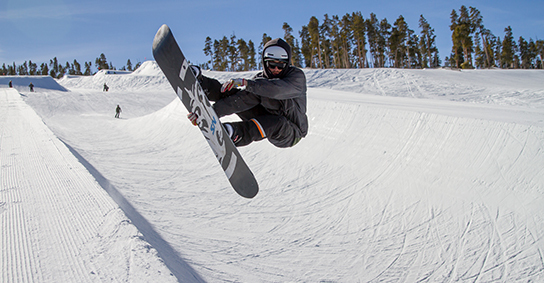 The A51 Terrain Park offers an educational program to help snowboarders fully understand the progression of terrain parks, from beginner to expert. The Keystone Skier and Snowboarder Responsibility Program offers everything the beginner needs to know in the way of safety. To make things more interesting, thirty new features will be offered this season, so even if you’ve been before, you have no excuse not to go back again. The park is home to several pros, and a simple ride on the Peru or A51 chairlifts grants you a front row seat to the best action the sport offers. A 22-foot superpipe is reason enough to include Breckenridge in Colorado among the most serious snowboarding spots in the country. Four award-winning terrain parks help to reinforce that reputation. Each year, events like the Dew Tour and Grand Prix come to town to utilize its legendary facilities. 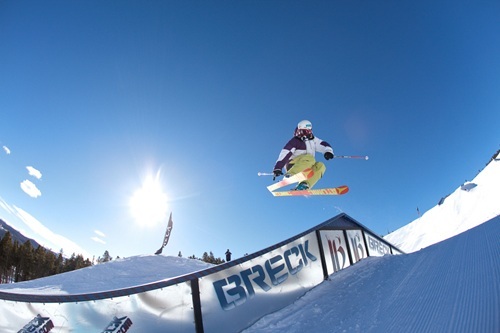 On Peak 8, “The Breck” boasts 14 jumps of various sizes, enough to keep beginners and experts coming back for more runs. Transworld Snowboarding’s top park of 2016 operates 134 days a year on 168 acres of snow that Southern California locals call home. The terrain park at Bear Mountain features learner, 12-foot and 18-foot pipes. The Red Bull Plaza offers the experience of urban snowboarding without the experience of getting arrested while urban snowboarding. It probably offers more rails than a real urban setting, and it definitely involves less cars.